Just as in Neo Ranga (also featured this month), Argentosoma (or Argent Soma, as it is known in Japan) shows what happens when different races collide. Rather than a gigantic island-god, however, the other race in Argentosoma is from outer space. This series unfolds slowly and relies heavily upon the use of flashbacks to flesh out the story, so early-on details are a bit sketchy. From what the first volume seems to suggest, some time before the chronological setting of the show, an alien race descended to Earth, wreaking havoc with superior destructive technology. Many humans lost their lives and whole cities were destroyed as these beings had their way with the Earth. They still come down and take lives when they get the chance, though their motivation or desires remain unknown to the general public. In an effort to better understand these creatures, Dr. Noguchi, a noted scientist and professor, spent all of his spare time researching their race. Not too long prior to the start of the show, he recovered parts of a ruined invader after an attack and began to study the corpse in detail within the subterranean lab he named "Morgue." Maki Agata, the love interest of Takuto Kaneshiro -- the main character -- helped Dr. Noguchi conduct his experiments on the possible reconstruction of the alien parts into a whole being once again. Takuto's expertise in chemical engineering caught Noguchi's interest, enough so that he brought the college student in to aid him and Maki. Tragically, the day Takuto arrived as a member of the scientific team was a day that would effectively end his life, as he knew it. When Takuto arrived at the underground lab, Dr. Noguchi was ready to bring the alien back to life. However, in the middle of the revival process, a government group stormed the compound and sent a power surge through the equipment. This didn't sit well with the alien, dubbed "Frank" by Noguchi, who awoke enraged. Frank promptly destroyed Morgue and escaped. 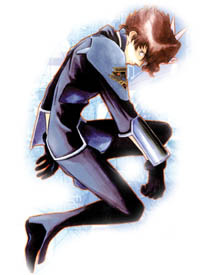 Takuto was the sole survivor. As the story unfolds, the writers present many interesting twists and turns. While in the hospital, a man who looks and acts like the devil himself contacts Takuto, planting the seeds of fury that will sprout into the broken man's desire for revenge against the monster that took Maki away from him. Far away from the city, Frank meets a young girl by the name of Harriet Bartholomew who looks remarkably similar to Maki. Her gentle nature helps her come to the conclusion that the grotesque alien is in fact an Elf from a magical realm. She quickly befriends the behemoth and in so doing binds her fate to that of Takuto. When Takuto finally recovers from his wounds, half his body is left irrevocably scarred. Since everything in his life was destroyed the night of the revival, he decides to kill his former persona and take on a new name -- Ryu Soma. As Ryu Soma, he vows to hunt down the beast that soured his existence. He quickly discovers that the most practical way to such an end would be to join the paramilitary force known as "Funeral." However, the members of Funeral want to do more to Frank than simply destroy him -- he may be the key to defeating the alien forces once and for all, if they can find a way to control his power. This series is full of intrigue and drama, and if the first bunch of episodes is any indication, there's going to be quite a bit of sorrow to come. Yet, even though it's gritty and somewhat of a downer at times, it can also be funny thanks to the input of Harriet and some of the friendlier teammates of Funeral. So far, the show has balanced its darker elements admirably with the lighter side of things, and it seems likely that future episodes will continue that trend. Put together on the top end of things by Hajime Yatate (the team behind a number of other popular anime series, perhaps most notably Cowboy Bebop), this is a very solid show with a plot anyone can follow. For the mech enthusiasts, there's plenty of interesting technology to drool over -- in particular the well-animated SARG units employed by Funeral -- and for the conspiracy fiends, it's hard to tell who's doing what for the good of whom. Overall, I have a feeling that this is going to be an interesting show that stays mysterious without being annoyingly cloudy in the story department. The first volume can be purchased alone or with a lovely art box from Bandai, which is a practice I'd like to see continue in the future. I wonder if anime companies know how many first volumes I've purchased just to get a hold of a limited edition collector's box. When it comes to things like that, I guess I just have no willpower.